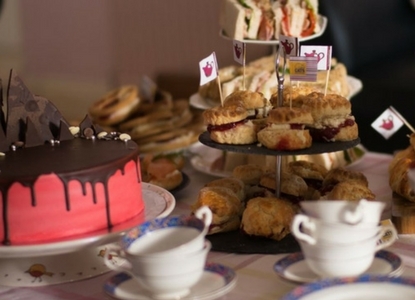 Pawsome Afternoon Tea is back for 2018 and it’s going to be even more paw-some! Last year saw cat lovers from Penzance to Shetland gathering together with friends and family for a slice of cake and a cup of tea, all to raise funds for the thousands of cats and kittens in Cats Protection’s care. It’s a good idea to get your invites out early so your guests can put the date in their diaries. You can download some invite templates from www.pawsometea.org/resources or even set up a Facebook event to invite your friends to. A Pawsome Afternoon Tea doesn’t necessarily have to be in the afternoon. Perhaps a morning or evening event would better suit you and your guests? You could also choose to host your event outdoors if the weather will allow! Whether it’s a Mad Hatter’s tea party, a teddy bears’ picnic or a vintage soirée, introducing a theme will enable you to get even more creative and add some magic to the occasion. Rope some of your friends or family members in to help you organise the event and delegating certain tasks to them. This will help the event run much more smoothly and enable you to take advantage of everyone’s skills. Making as much as you can in advance will make the day much more relaxing for you. Lots of food can be prepared and then chilled or frozen beforehand, ready to be baked on the day. We all love a bit of cake, but it’s always good to have a balance. Serving your guests some cucumber sandwiches, sausage rolls and mini quiches will ensure there’s something to suit everyone’s taste. There are hundreds of different teas you can serve your guests, so why not give them a selection? Alternatively, you could opt for a cooling iced tea, or add some sparkle to the occasion with a bit of prosecco. The free Pawsome Afternoon Tea Pack contains some great ideas for games you could play with your guests, or if you’re holding your event outdoors, maybe some croquet would keep everyone entertained. Start the fun early by making some decorations to spruce up your venue. There are lots of ideas for cat crafts at www.pawsometea.org/resources, including bunting, balloons and pom poms! 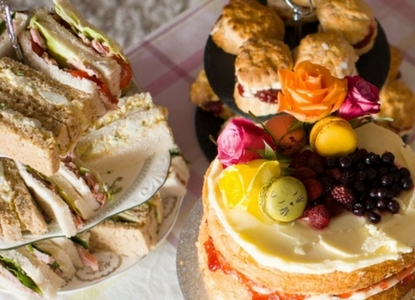 Tea cups, teapots and tiered cake stands will help show off your mouth-watering spread in all its glory. Don’t worry if it doesn’t match or isn’t expensive – you could even see what your local Cats Protection charity shop has in store. Finally, get baking, brewing and don’t forget to enjoy yourself! 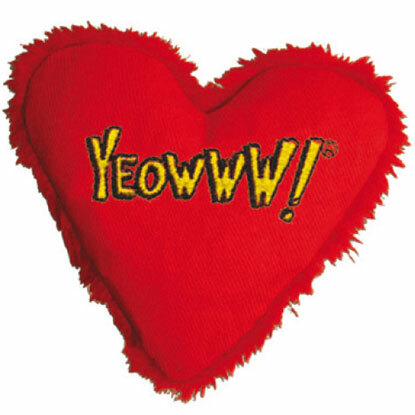 To read some pawsome stories from last year’s events, click here. Neutering is an important part of owning a cat, but is a subject that many cat owners don’t know much about. There are lots of common myths that can stop owners from getting their cat ‘done’, but the truth is that neutering is the only effective way to keep the UK’s cat population under control. If you’re worried that you can’t afford to get your cat neutered, Cats Protection may be able to help. We offer financial assistance to cat owners on benefits or low incomes through our means tested neutering scheme. To find out if you’re eligible for vouchers, call our neutering helpline 03000 12 12 12 (Mon-Fri 9.30am-1pm). 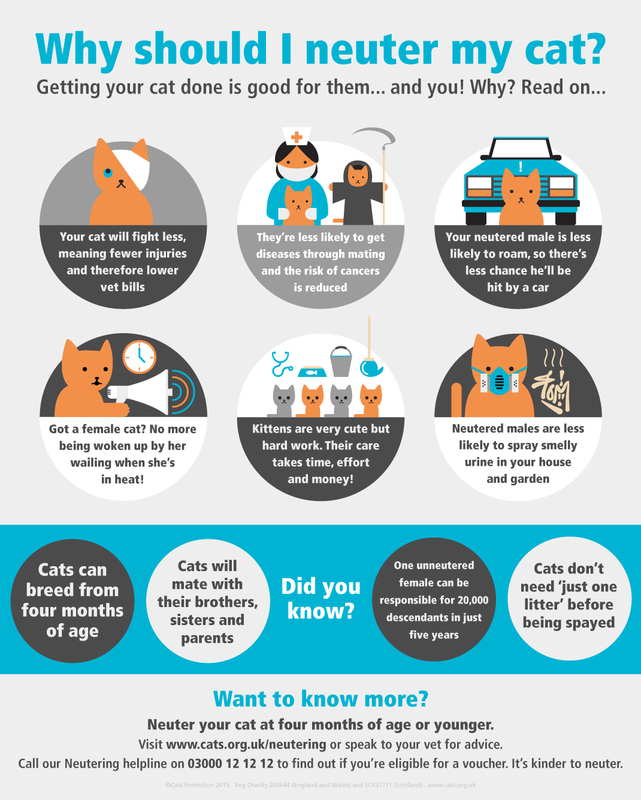 To find out more about the benefits of neutering your cat, take a look at our infographic below and visit the Help & Advice section of the Cats Protection website. Cats Protection’s Bridgend Adoption Centre is awaiting the arrival of a litter of kittens as the latest cat to arrive in their care is heavily pregnant. 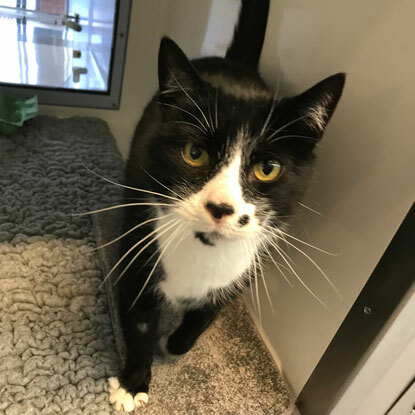 Gorgeous three-year-old moggy Daisy come to the centre after her owners moved away and left her behind, and she is thought to be around eight weeks pregnant. 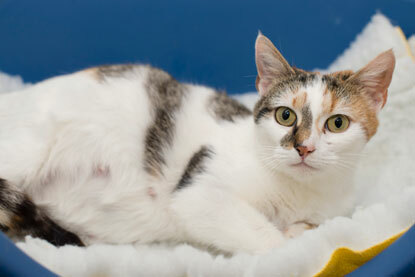 For cats, pregnancy lasts for 63-65 days, or around nine weeks, so Daisy could be just a week away from giving birth. When she arrived at the centre she was given a full vet check-up and has thankfully been given a clean bill of health but will be closely monitored by the Bridgend staff to make sure she remains as happy and healthy as possible. 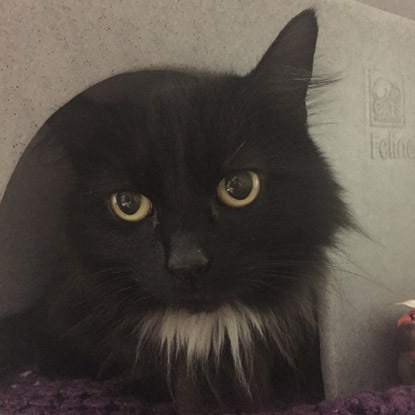 Pregnant cats, known as queens, need somewhere quiet, clean and warm to give birth, so Daisy has been put in a secluded and cosy pen with lots of comfortable bedding. She needs to eat 25% more than a normal cat would, so is being fed regular meals of kitten food, as it is higher in nutrients than adult food, and has access to plenty of fresh water to keep her hydrated. Daisy is very affectionate with the Bridgend staff. She is calm and relaxed and has a very loud purr, which suggests she is very content. It is not yet known how many kittens she is expecting, but it could be between one and nine! Although the arrival of kittens is exciting, giving birth can be incredibly stressful for a cat, and the kittens would need to find new homes, so we recommend getting them neutered from four months old. There are already thousands of cats waiting to find loving homes across the UK, so neutering is the most effective way to reduce the number of unwanted cats coming into our care. To find out more about the importance of neutering, visit the Cats Protection website. Over the next few weeks and months, we will keep you updated on Daisy’s and her kittens' progress, but if you would like to help towards the cost of her care then you can sign up to become a Cats Protection sponsor. 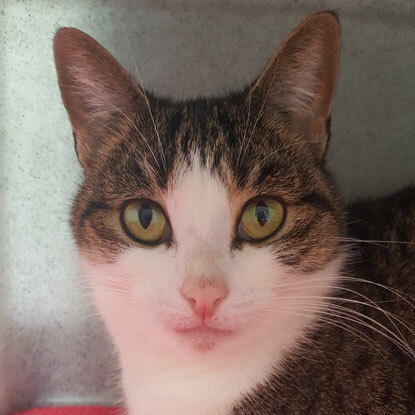 Daisy is one of our many sponsor cats, so from as little as 19p a day you can sign up to help us provide her with the shelter, food, medical care and love she needs and receive regular updates about her and the other cats you are helping in return. Alternatively, if you would like to make a one-off contribution to Daisy's care, you can donate via the adoption centre's Just Giving page. 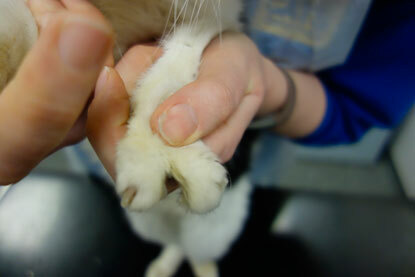 A tabby-and-white moggy in the care of Cats Protection’s Warrington Adoption Centre has some very unusual paws. While most cats have five toes on each of their two front paws, 11-year-old Clawdia was born with just two. 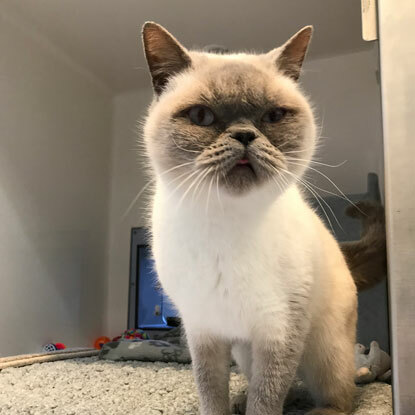 Sonia Scowcroft, the centre’s Manager, said: “When she arrived in our care, we noticed that she was missing three toes from each of her front paws. We believe she was born like this but it doesn’t stop her from living a completely normal life. 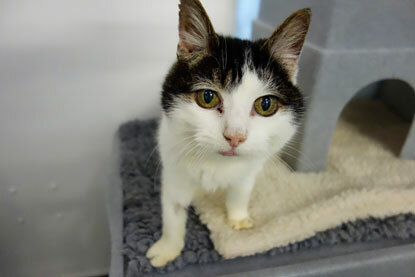 Clawdia came to the centre after being found as a stray in the Great Sankey area of Warrington, and the staff have made every effort to find her original owners. Like all Cats Protection’s cats, Clawdia is now neutered, vaccinated and microchipped and is up-to-date with her flea and worm treatments. In addition, she also has four weeks’ free pet insurance. 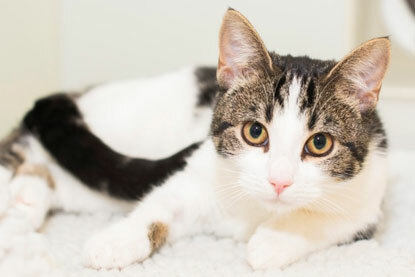 If you would like to offer Clawdia, or any of the other cats in the care of the Warrington Adoption Centre, a home, call 03000 12 06 12 or visit their website. To find out more about the benefits of microchipping your cat, please visit the Cats Protection website. 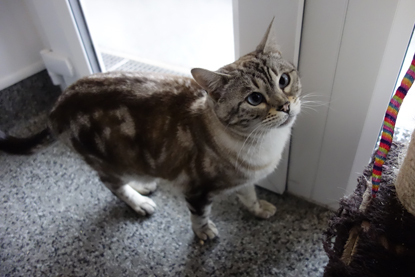 Cats Protection’s Warrington Adoption Centre is hoping that the Force will be with beautiful Bengal cat Yoda as he searches for a new home. 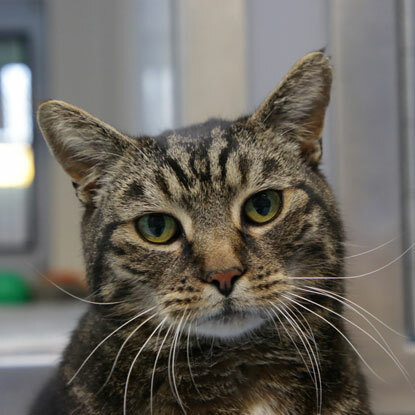 The moggy, who shares his name with the wise Jedi Master from Star Wars, was brought into the centre’s care from a galaxy far, far away because of his behavioural issues which are specific to the Bengal breed. His new Jedi friend would need to be patient and calm but would receive lots of love and affection in return. As a territorial cat, Yoda would prefer to live in a rural area with a low population of other cats and have plenty of space to burn off all of his excess energy. He doesn’t mind living with older children, but any loud noises can cause him to get stressed so a quiet home would be ideal. If you would like to find out more about Yoda, do or do not, there is no try. You can get in touch with the Warrington Adoption Centre on 03000 120 612 or visit their website. 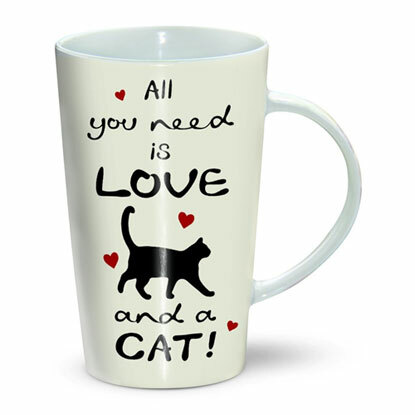 When you can’t speak fluent cat it can be difficult to tell your moggy just how much you really love them. Instead of attempting to translate your affection into meows and purrs, try these simple signals that will show them you care. When your cat slow blinks at you, it’s their way of saying ‘I trust you enough to close my eyes in your presence’ and this is a big deal for a cat! If you return the gesture you’ll be letting them know that you have acknowledged this sign of affection and feel the same way towards them. Although cats are very good at grooming themselves, most moggies will appreciate a little help from time to time, particularly if they have long fur. 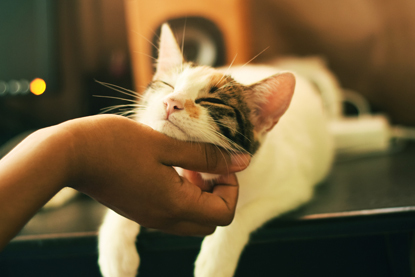 Gentle brushing or even stroking in those hard to reach areas, such as under the chin and behind the ears, is sure to generate a lot of purrs in return. 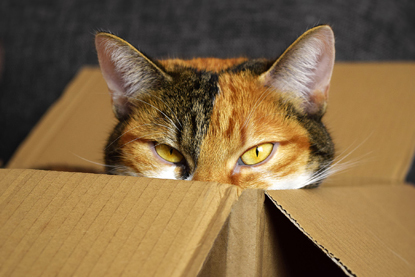 Cats love boxes because they help them to feel safe and secure. As they are solitary creatures by nature, having somewhere to hide and snooze in peace is important and even better if it’s up high as it means they can easily see their surroundings. Try filling a box with a blanket to make it even more cosy and place it in a quiet corner of the house. Cats are natural hunters, but their love of stalking and pouncing is driven by the thrill of the chase, not hunger. Playing with your cat will cause their brain to release feel-good hormones called endorphins and help them to burn off all that excess energy. Just 10 minutes of play a day is enough to keep them happy, healthy and your best friend. A trip to the vet might not sound like something your cat will love you for, but trust us when we say they will appreciate these two simple procedures eventually. Neutering will make your cat less likely to roam, get into fights and get diseases, not to mention save them from having to look after litters of kittens. Microchipping will help them get home much quicker if they get lost, and also means you can get a cat flap that only opens for them, stopping any moggy intruders from invading their territory. 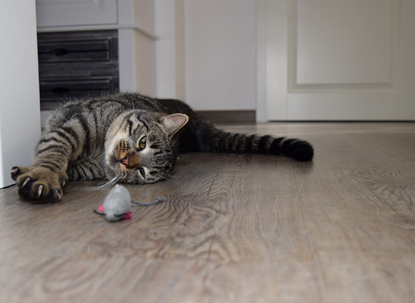 In addition to these simple gestures, it’s also important that you meet your cat’s five welfare needs to ensure they can live a happy and healthy life, safe in the knowledge that you’re looking out for them. For more information on how to care for your cat, visit the Help & Advice section on the Cats Protection website. Cats are usually keen on having their own space and so are not too happy when another moggy invades their territory. This is something Simon Tofield knows all too well, as his cats would often argue with Jazz, the big fuffy kitty from next door, whenever they crossed his path. In the latest Simon’s Cat Logic video, Simon explains how Jazz became his moggies’ arch-nemesis as they faced off about who’s land was who’s. Then, when they moved house, another character arrived on the scene – a big ginger tom with a habit of peering through the cat flap and driving Simon’s cats crazy. 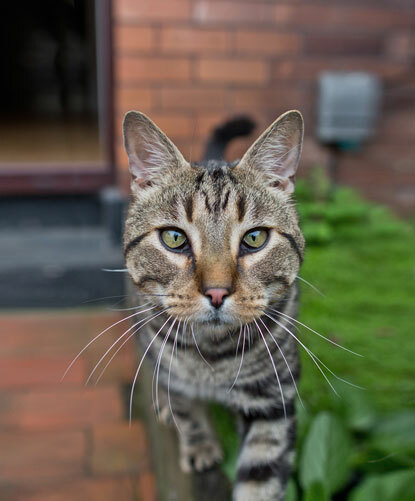 In the video, Cats Protection’s Behaviour Manager Nicky Trevorrow is on hand to explain the reason behind cats’ territorial behaviour and how rubbing, scratching and spraying helps them avoid unwanted contact with their neighbours. She also provides some helpful advice on how you can make sure your cat feels safe and happy in their own territory and reduce the risk of them fighting with the other cats they come across. You can then watch a new animation in which Simon’s Cat inadvertently makes him jump while watching a scary movie and then gets scared himself while wrestling with a vacuum cleaner! Following a successful first year, Cats Protection’s Paws Protect service is expanding into three new counties – Sussex, Kent and Surrey. Currently operating in London, Hertfordshire and Essex, the service was originally set up in response to a number of enquiries received in relation to domestic abuse and pet safety. The service is a support for cat owners fleeing from domestic violence, keeping cats safe until they are ready to be reunited. On referral, cats are health checked before being temporarily homed with a foster carer. 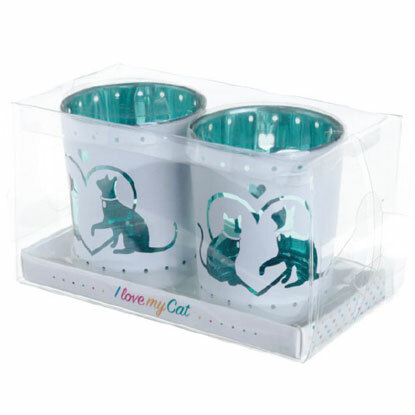 All information shared between the cat owner and fosterer is confidential and coordinated by the Paws Protect team, ensuring complete anonymity. 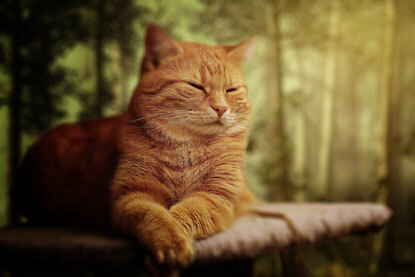 Adding to the success of the project’s first year as a stand-alone Cats Protection service, the charity won a competition by video production company Through the I to receive a pro bono video promoting the project. Sharing details of the service, the video invites people to become Paws Protect fosterers, or if they aren’t able to give their time, to donate instead. Further details about the service can be found by heading to www.cats.org.uk/paws-protect. 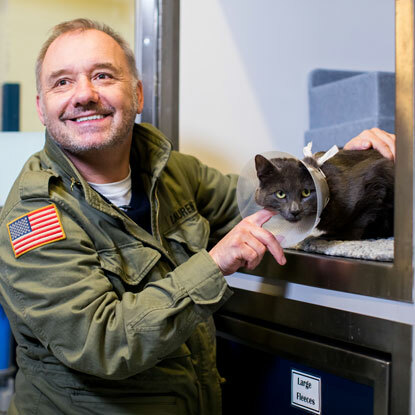 Fond Margaret, Ron Com and DJ Loveham, these are just some of the names cat-loving comedian Bob Mortimer has chosen for unwanted moggies being cared for at Cats Protection’s National Adoption Centre. 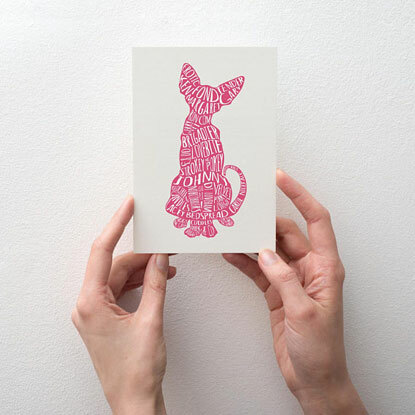 Bob started coming up with unusual cat names as a way to amuse his followers on Twitter and then began turning them into feline-themed artwork sold online by Wordynumnum. A portion of the profits from each sale are donated to Cats Protection, so the charity invited Bob to visit its centre in Sussex to say thank you. While he was there he got to meet some of the cats who have been given his ‘romantic’ cat names, which have been used in a ‘Tender Gary’ art print for Valentine’s Day. Bob explained: “I’m a big cat lover and have always had them in my life so it’s great to be supporting Cats Protection, which does so much to help unwanted moggies. I have two cats at the moment, called Goodmonson and Mavis, but I love naming cats and am always calling them different things every day. Fond Margaret was found straying in a garden in Romford for six weeks plus. Her age has been estimated at 10 years old. She’s a really sweet, loving, friendly girl who loves a fuss and will be available for adoption soon. DJ was found as a stray in Tunbridge Wells and had been in the area for up to a year. His age has been estimated at one-year-old. He is absolutely lovely, loves attention and is very talkative. He has a collar on at the moment to prevent him from scratching his wound, but will be available for adoption once this has healed. 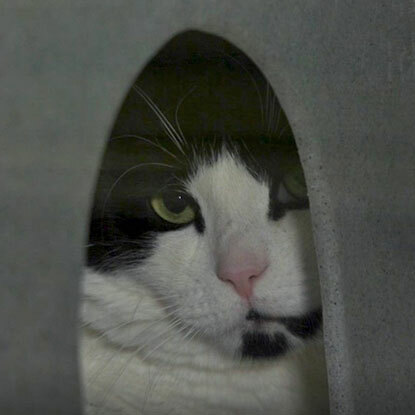 DJ would like a home with a garden with someone who can give him copious amounts of fuss. Dependant on a successful introduction at the centre he may be able to live with children. Lacey was found straying in Camberley for six months. When she came in we located a microchip so contacted the owner but they’d rehomed her and the details weren’t updated so we can’t trace an owner. She’s eight years 11 months old from the microchip. She’s a very shy girl who’s currently seeking security from underneath her fort. She’s available for adoption now and is looking for a calm home where she can get used to things at her own pace. Ron Com was found straying in Basildon. 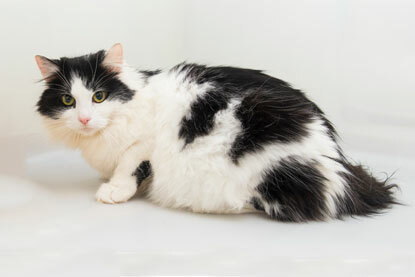 His age has been estimated at six years old, he’s black and white and available for adoption now. He’s a very timid boy so probably looking for a really quiet home with an understanding owner who will let him settle at his own pace. It would probably be best he’s homed without children or animals. To look for cats available for adoption in your area, visit the Cats Protection website. 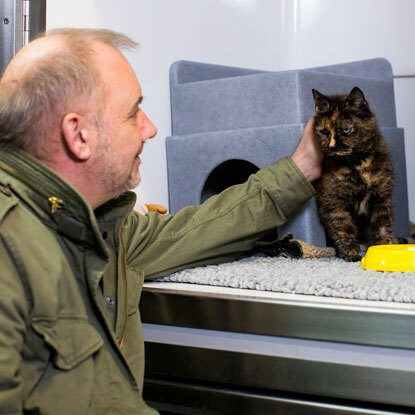 Tender Gary went to live with a man who is a huge fan of Bob Mortimer and was thrilled to adopt a cat named by him. Softy was homed to a lovely couple who fell head over heels in love with her (how could you not?!). Mr Snuggles was in and out within eight days and has gone to live with a really lovely couple whose own cat recently passed away. 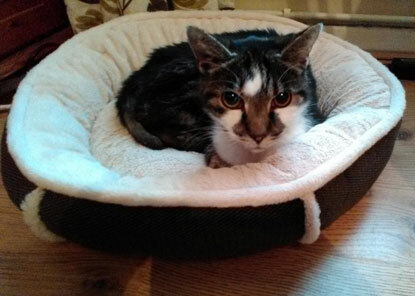 Carol came into care after her owner passed away, but it now settled into her new home where is shown lots of love. 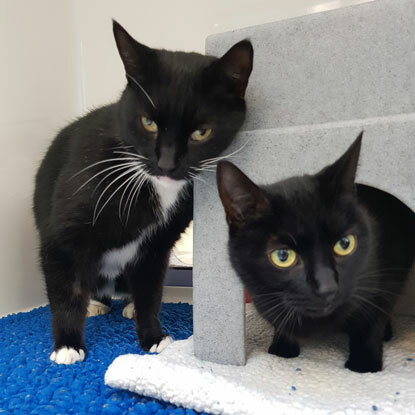 Kedgeree (male, black and white) and Candles (female, black) came into care with Carol Niceface but have now found new owners willing to fuss over them. Tabby-and-white cat Kitty is now safely back home with her relieved owner after suffering a nasty injury to her tail. It is thought she had been attacked, possibly by a fox, and was found cowering beneath bushes in Leigh in October 2017 by a member of the public, who called Cats Protection’s Southend & District Branch for help. Volunteer Jan Davies arranged for the cat to be taken to the local Vets4Pets, where she was given emergency treatment straight away. Her tail had been badly bitten and had become infected, one of her teeth had broken off and become wedged in the roof of her mouth and she was incredibly thin. Rafe named the cat Kate, after the singer Kate Bush, because she had been found under a bush, and provided her with everything she needed while she recovered. However, a few days later he noticed that her tail was not getting better and so Kate had to go back to the vets to get half of it removed. Throughout Kate’s ordeal, volunteer Jan Davies had been trying to trace her owner, but as she had no microchip and there were no matches for her on the branch’s Lost & Found register, she hadn’t had any luck. She put Kate’s photo on the branch’s website and within a week received a call from Barbara Peach, who thought the cat might be hers. She revealed that her cat Kitty had gone missing from her a garden a few weeks previously but after searching day and night for her she had started to lose hope. As soon as Kitty’s tail had healed she went home with Barbara and has since been microchipped. Barbara was so grateful to Cats Protection for helping Kitty that she presented the Southend & District Branch with a generous cheque to help them care for other cats in the area and has now become a member of the charity. 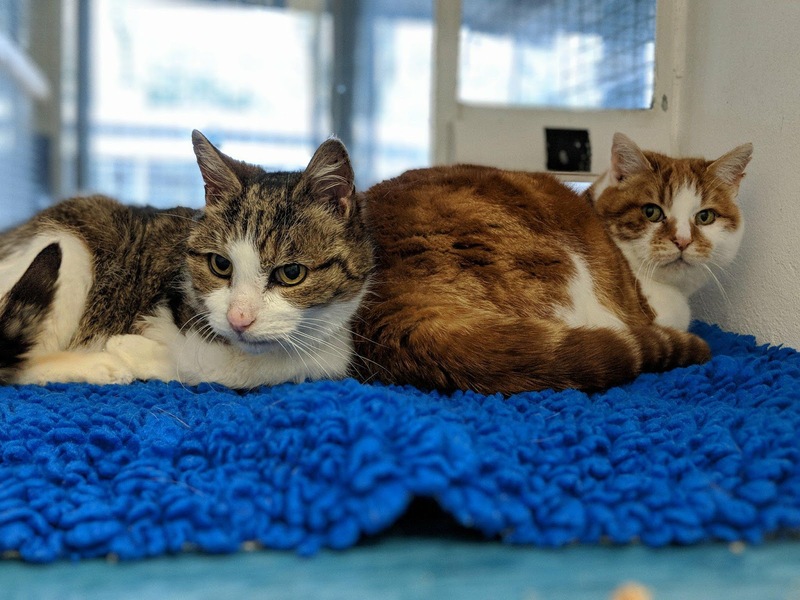 Cats Protection’s Birmingham Adoption Centre is appealing to local cat lovers to take in two mature moggies in their care. Captain and his best buddy Pugwash have been overlooked for adoption time and again because of their age and medical needs, but all they want is a loving home together. Can you give Captain (left) and his best buddy Pugwash (right) a home? Captain is around 15 years old and had to have one of his front legs amputated when he was younger. Having to take all of his weight on his remaining legs has left him with arthritis, but he happily gobbles up his daily medication with no fuss when it’s hidden in his food. Pugwash is around 10 years old and has taken it upon himself to look after his mate Captain. These two older kitties are very close and enjoy washing each other, eating together and curling up for a snooze together. To look for cats available for adoption in your area, please visit the Cats Protection website.